5th Bridge salutes the hundreds of people who have made this production possible… directors, choreographers, set designers, set builders, hair dressers, costume sewers, costume helpers, program designers, local business sponsors, concession volunteers, ushers, ticket agents, sound and lighting crew members, band members, cast members, refreshment volunteers, parent and community volunteers, and many, many more! Amazing things happen when people share their gifts and talents. 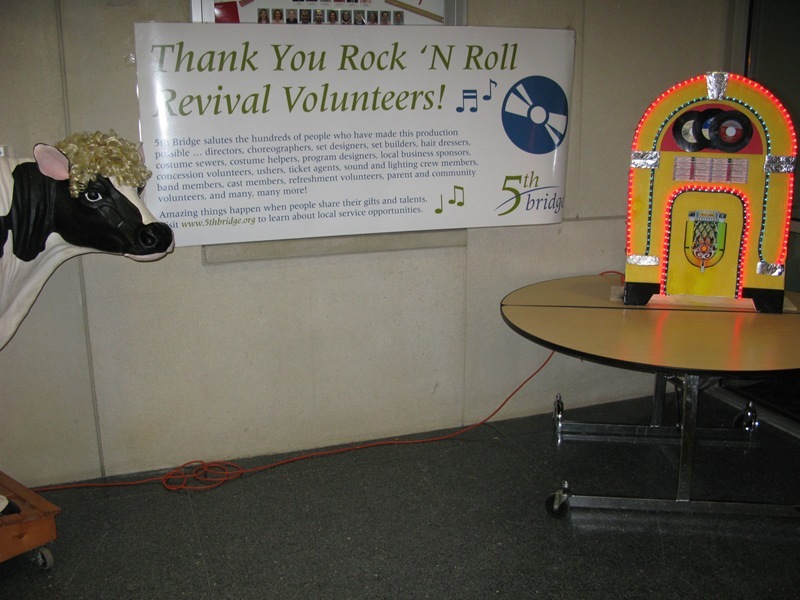 Visit www.5thbridge.org to learn about local service opportunities. I met two of the volunteers last night: Margaret Colangelo and John Colangelo, who were staffing the concessions table. Margaret works at Carleton and in her copious amount of free time, maintains two blogs: 1) Happy to be from Iowa even though I live in Minnesota; and 2) Endurance Diva – thrive while you survive. John has his own construction services company, Foggia Incorporated.